Everyone is very much kicked about Krishna Pushkaralu. Many of the people from Telugu states and other neighboring states are heading towards Vijayawada to participate in Krishna Pushkaralu. Celebrities from TV and Film industries are showing a lot of interest in these Krishna Pushkaralu. 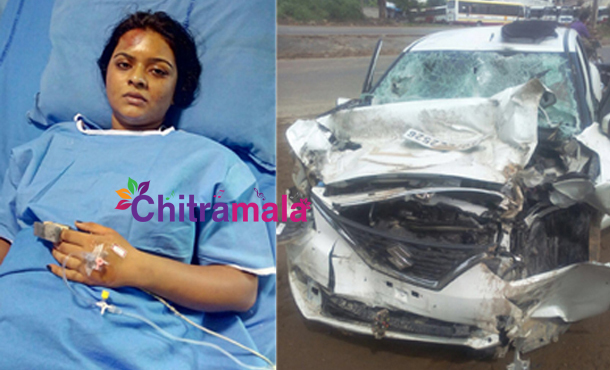 TV Actress Rohini Reddy who was shot to fame with Srinivasa Kalyanam serial has met with an accident while she was on her way to Pushkaralu. The accident took place near Ibrahimpatnam and her car has hit a Lorry. Driver Ushappa Goud, Assistant Chanti were in the car with Rohini. All of the three suffered severe injuries. Immediately, they were rushed to Andhra Hospital at Gollapudi. The doctors were treating on her currently.